Feel like taking another trip down memory lane? 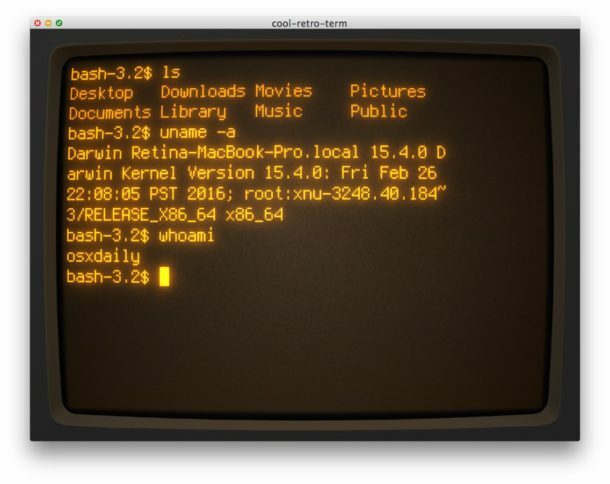 With the assistance of an excellent fun free retro terminal emulator fittingly called Cool Retro Term, you can experience the golden yesteryears of cathode display computing and pretend your shiny new Mac is an ancient Apple II or IBM workstation. Basically Cool Retro Term functions as a Terminal.app alternative that is heavily stylized to replicate that wonderful vintage look, and you can choose between a whole variety of color schemes and display effects to emphasize this. From that grungy looking amber on black text, to green on black, or white on black text, but the real fun comes with the various display effects of screen burn, jitters, scan lines, flickering, screen curvature, and the big blocky pixels that defined the dinosaur computing error. It’s not quite the antikythera mechanism, but it’s close enough for some of us. 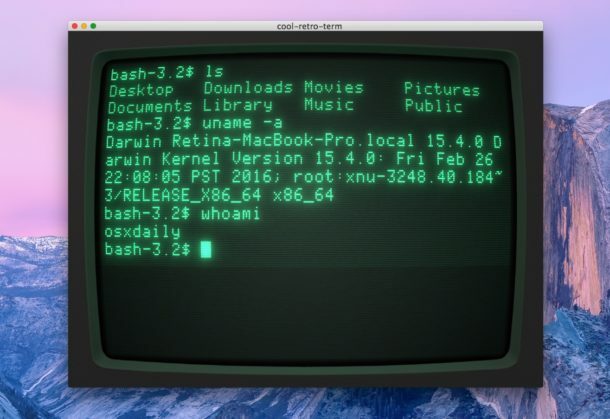 Cool Retro Term is available for Mac OS X and for Linux, which makes the most sense given the Terminal replacement, but it’s open sourced too just in case you want to try and port it over to your TI-85 graphing calculator or Nokia flip phone. This is obviously just for fun, but since it is a terminal you could absolutely do real work within the goofy looking vintage environment if you wanted to. As you can see there are no shortage of visual customizations and effect filters to adjust, so get the app and have some fun. 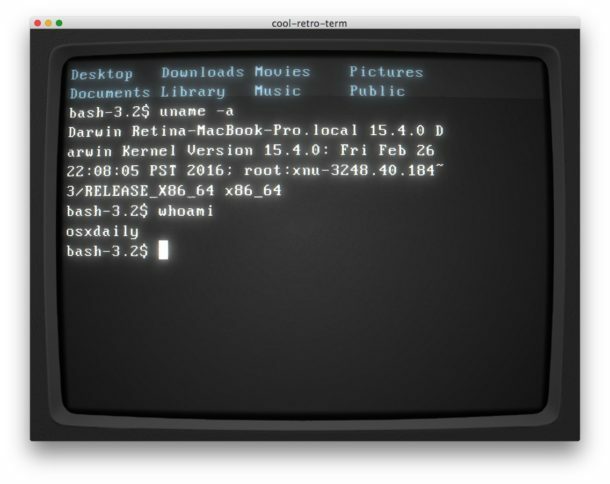 And yes, if you’ve been a longtime reader of osxdaily than you have undoubtedly noticed we are fans of retro computing, and we have mentioned similar apps around here some time ago, but Cool Retro Term is by far the most elaborate and well crafted of the Terminal emulators, plus it runs in MacOS Sierra and Mac OS X El Capitan too. 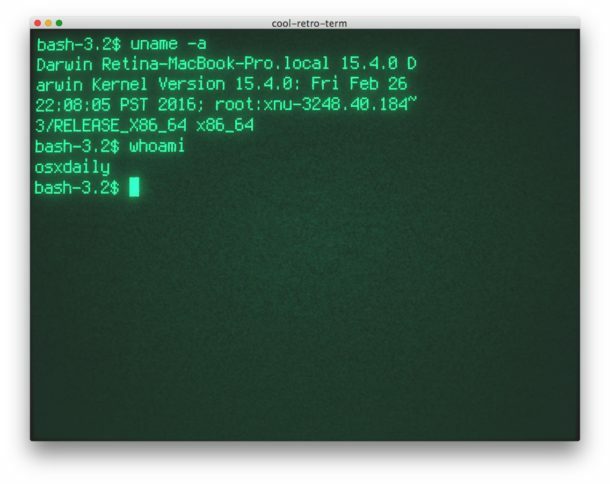 Oh and in all seriousness, if you are looking for a legitimate Terminal.app alternative, try out iTerm2 instead, which is really quite good. This is a pretty cool Terminal, very retro. Awesome! Thanks for the tip. Remember the old VT320 days? I learned C programming on a VAX. I leaned UNIX in the military fro 1989 to 1993. I adore Cathode but I use a CLI constantly and the truth is, iTerm2 is more powerful and better meets my needs. Given that both Cool Retro Term and iTerm2 are OSS, I’d love to see the features of the former integrated into the latter. P.S. 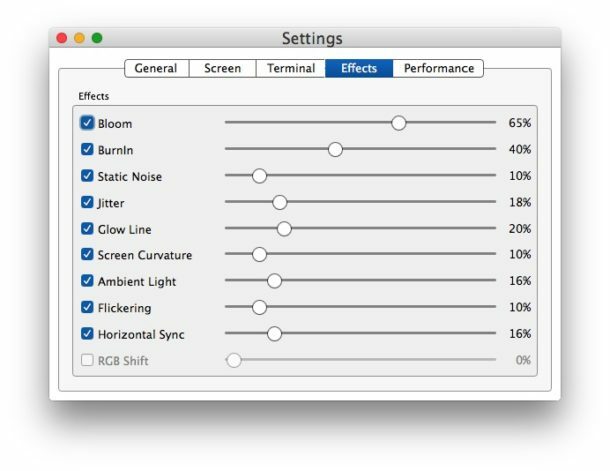 If you don’t need/want a Terminal replacement, the developer of Cathode has included most of the same features in an editor called “Blinky”. Highly recommended.